Key players in the market are adopting several strategies such as acquisitions and mergers, business expansion and collaboration to expand their geographical reach, says TMR. In September 2016, Stryker acquired Instratek, Inc., - a U.S.-based orthopedic implants and endoscopic instrument manufacturer. This acquisition helped Stryker fortify its market share in the orthopedic devices market. Based on product, the joint reconstruction segment dominates the global market owing to the rising demand of orthopedic devices among consumers. However the segment is expected to lose market share over spinal devices segment towards the end of the forecast period. This is because of stringent FDA regulations for product approvals and high investments. On the basis of geography, North America is projected to lead the market during the forecast period. Factors such as rising geriatric population, developed medical infrastructure and presence of key players are expected to drive the global orthopedic devices market in the region. The global orthopedic devices market is projected to grow at a significant pace during the forecast period. This is mainly because of the growing geriatric population across the globe. Geriatric people are highly susceptible to develop bone related disorders. This is expected to increase demand for various orthopedic implants and devices from this populaces. Apart from this, rising prevalence of diabetes and obesity, poor diet, lack of physical activity, and rising trend of smoking and alcohol consumption are some factors that can cause damage to bone health. This could pave way for the growth of sorthopedic devices market. Along with this, innovations in the field of osteology such as advancement in 3D printing, robot-assisted surgical procedures, and smart implants are helping manufacturers cut down cost of the orthopedic devices. This is leading to an increasing adoption of orthopedic devices in the emerging economy as well thus offering a significant push to the orthopedic devices market. Despite several drivers, the growth in the orthopedic devices market is hampered due to the rising incidence of device failure and manufacturing errors. This is preventing widespread adoption of orthopedic devices among surgeons and patients, which in turn affects sales. The recalls and associated lawsuits have criticized orthopedic companies leading to loss of reliability in the minds of customers. For example, in December 2016, Greatbatch Medical, has launched faulty offset cup impactor device in the market. The device failed sterility test, following which product recall and associated lawsuit led to criticism for the company for its reckless behavior. 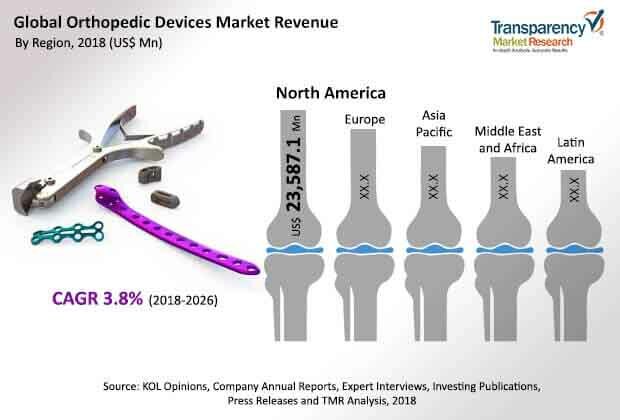 However, surge in road accidents and sports injuries, and spurring demand for minimally invasive surgeries are key drivers likely to offer lucrative avenue for the growth of the global orthopedic devices market.